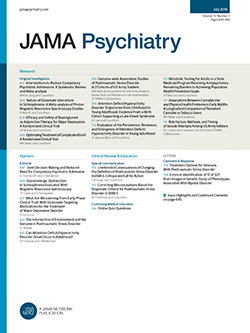 This issue of JAMA Psychiatry marks the transition to a new editor in chief. Three outstanding psychiatrists edited the journal when it was known as Archives of General Psychiatry: Roy R. Grinker Sr, MD (1959-1969), Daniel X. Freedman, MD (1970-1993), and Jack D. Barchas, MD (1994-2001). For the last 13 years, Joseph T. Coyle, MD, continued this tradition masterfully through the electronic evolution of the journal and the transition to JAMA Psychiatry in January 2012. I thank Joe for his outstanding leadership and his mentorship, especially during my time with him as the associate editor of Archives of General Psychiatry (2003-2011). The new editorial office will include Dost Ongur (associate editor), Jennifer Blackford (managing editor), Ira Phillips (web editor), and Helena Chmura Kraemer (statistical editor). Twenty leading experts in psychiatric research will advise us as members of the editorial board. The landscape of scientific journals is rapidly changing. The major processes including manuscript submission, review, and dissemination are now fully electronic. Content is published online first each week and republished in a formal issue released in print and online once a month. This has reduced turnaround times from submission to acceptance to publication and has made information quickly accessible. Most of us do not visit libraries anymore; we now browse journals on our computers and mobile devices. As part of The JAMA Network, we have access to a full array of multispecialty journal content and electronic platforms and we will use them to optimally support authors and readers. JAMA Psychiatry publishes cutting-edge research and seminal contributions to the psychiatric literature. The Original Investigations will remain the core of the journal. We are receiving an ever-increasing number of submissions, now more than 1300 per year. We will add more reviews, meta-analyses, and opinion pieces that can shape our field. While we cover the full spectrum of psychiatric research submitted by colleagues around the world, there are several areas of particular interest. Epidemiological research has been a major strength and we will continue to publish the scholarly analysis of archival data sets. We will also focus on epidemiological studies that can shed light on the mechanisms of risk factors, such as trauma or environmental exposure. Epidemiological study designs can now be married with the in-depth analysis of genetics and neuroimaging to provide truly mechanistic insights into pathogenesis. The increasingly complex genetic analysis of mental disorders is crucial for our understanding of disease mechanisms and the identification of treatment targets, ultimately leading to personalized psychiatry. We invite psychiatric geneticists to submit their best research to JAMA Psychiatry. Neuroimaging is now a widely available technology. We will especially be looking for longitudinal neuroimaging studies that provide unique insights into the neural mechanisms of treatment response, disease course, and outcome. Only then will neuroimaging become useful to clinicians in their clinical assessment of patients. Finally, we will emphasize treatment studies, particularly clinical trials of both pharmacological and nonpharmacological interventions. They remain the touchstone of scientific progress in psychiatry. I am excited about new opportunities for JAMA Psychiatry. We will discuss strategies for psychiatric research, translate scientific discoveries into clinical practice, and explore the impact of psychiatry on society. While scientists are unraveling the mysteries of the human mind, this new knowledge has had limited impact on the current practice and teaching of psychiatry. Most of our diagnostic concepts have been with us for 100 years and many of our treatments were discovered more than 50 years ago, often by serendipity. This lack of progress has led some to ask for radical changes in how we study mental illness, including the creation of a neuroscience-based diagnostic system. JAMA Psychiatry will provide a forum to explore the scientific structure of psychiatry by asking: what can we know and what should we do? To close the gap between psychiatric research and psychiatric practice, we need to teach neuroscience principles in the clinical setting. The core teaching of psychiatry (psychopathology, diagnostic formulation, and treatment planning) does not rely on even a basic concept of how the brain gives rise to the mind. Many good psychiatrists readily admit that they do not consider neuroscience a necessary knowledge base for their practice. We need to train a new generation of psychiatrists who are grounded in classical psychiatry but also eager to interpret brain scans, cognitive neuroscience experiments, genetic analyses, and epidemiological data sets. This will only work if we make research more relevant in the clinical setting. For example, when a clinician assesses a patient for anxiety symptoms vs panic attacks, does it help to know about the roles of the amygdala and the bed nucleus of the stria terminalis? Only when neuroscience models support clinical decision making will our research advance the clinical practice of psychiatry. JAMA Psychiatry will expand the Neuroscience and Psychiatry section, which Dr Coyle started in January 2013, and will use case-based learning principles to support this important maturation of psychiatry as a clinical neuroscience discipline. Natural scientists and social scientists innovatively map the vast territory of the human mind. Psychiatry needs this information but has another task, delineating abnormal mental states and deciding about the need for treatment. This is not trivial and cannot be solved by science alone. The current limits of psychiatric science become apparent when diagnostic systems are up for renewal, resulting in the addition and removal of psychiatric diagnoses. We have to embrace that mental illness is shaped by culture and society; JAMA Psychiatry will look for contributions to this discourse. As psychiatrists, we constantly need to balance our paternalism with the autonomy of the individual, most clearly seen in the legal conflict between forced treatment and the protection of personal liberties. Societies continue to struggle with this balance. The mental health problems among the homeless, high rates of mental illness in prisoners, and recent debate about gun laws and mental illness are just 3 examples that deserve scholarly treatment in this journal. The task of psychiatry is complex and often uncertain. But despite uncertainty about what we know and should do, there is genuine progress. The mental health of our societies continues to improve and it is the scientific exploration of the human mind that has made the difference. We can use our brains to understand our minds. JAMA Psychiatry will support this scientific project and we are honored to be part of this effort. Corresponding Author: Stephan Heckers, MD, Department of Psychiatry, Vanderbilt University, 1601 23rd Ave S, Nashville, TN 37212 (stephan.heckers@vanderbilt.edu).